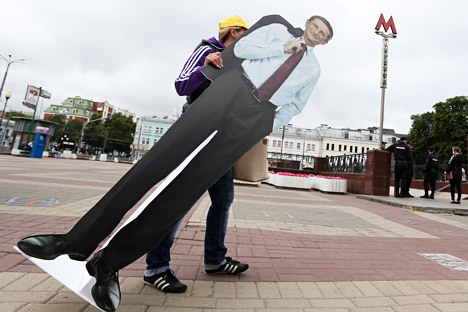 Over half of Russia’s citizens ignore the country’s political processes. Russians are only mildly interested in politics, opinion poll data shows. More than 65 percent of respondents believe political parties only look after their own interests and do nothing for the people. Experts explain these attitudes by the fact that the older generation is conceding the civic stage to younger Russians, who believe politics are irrelevant today. Almost two-thirds of Russian citizens (65 percent) believe political parties pursue their own interests and the results of this struggle “don’t benefit the people.” These statistics are according to a July 18-22 Levada Center poll of 1,600 Russians in 45 of the country’s regions. People are increasingly disappointed, not only in parties and politicians, but also in elections, the Levada Center deputy director, Alexei Grazhdankin, believes. He notes that attitudes toward political parties are shaped by the role they play in the country’s life, and the country’s political system is presidential, while the role of parliament is small. Half the respondents (51 percent) admitted that they do not follow politics. Moreover, 59 percent said that politics “are boring”—up from 48 percent last year (the poll’s margin of error is 3.4 percent or less). “Whether or not you protest, nothing is changing in the country. People have grown tired of this; they are losing their belief that anything could be changed at all,” says Grazhdankin. Indifference to politics has been the dominant sentiment in Russia for a number of years. For example, according to a 2011 All-Russia Public Opinion Research Center (VTsIOM) poll, two-thirds (61 percent) of Russians were not following the country’s social or political life. The respondents said at the time that they were not interested in politics in principle (36 percent), and they pointed out that “it wasn’t worth the effort” (25 percent). Only in 5 percent of all cases did they claim not to have any sympathy for any of the politicians. Sociologists point out that Russians were highly interested in politics in the 1980s and 1990s. During the 2000s, political activity peaked in 2004 and 2007: Only a third of citizens did not want to have anything to do with this sphere then (32 percent and 39 percent, respectively). According to Leonty Byzov, a senior researcher at the Russian Academy of Sciences’ Social Studies Institute and a member of the VTsIOM Academic Board, Russians’ indifference to politics has been around for a while already. The expert believes this has to do with the fact that the older generation which lived through the period of political activism in the 1990s, is conceding the civic stage to young people. Based on materials from Kommersant and Novye Izvestia.